Yangqin (hammered dulcimer) Soloist of Melody of China Yangqin Zhao, prophetically named after the instrument she has become famous for playing, has established herself as one of the foremost yangqin (Chinese dulcimer) performers in the world, having been elected to the prestigious Chinese Musicians Association and the Chinese Nationalities Orchestra Society. Showing promise at an early age, she studied yangqin under professor Qian Fang-Ping of the Nanjing Arts College. In 1982, she graduated with honors from Nanjing Normal University’s Music Department and eventually became head of the faculty of instrumental music of that university. 1982 was the year that produced another outstanding achievement in the developing career of Yangqin Zhao. It was the year when the Peoples’ Republic of China, Ministry of Cultural Affairs, held the first nationwide competition for folk music instrumentalists, open to any one of China’s more than a billion inhabitants. The contest was open to candidates playing any folk instrument of their choice. Yangqin Zhao, playing her namesake instrument, the hammered dulcimer, won the nation’s highest award. Later, her performance of the Yellow River Boatmen Song, rearranged from a well-known piano piece, was recorded commercially in Shanghai. From 1984 to 1986, Yangqin attended the Shanghai Conservatory of Music to further study the yangqin under Professors Shengmao Hong and Mingqing Guo. At this time she ventured into new musical areas seeking innovative techniques to expand performance possibilities while retaining the pure, native characteristics of the traditional yangqin instrument. In 1987 and 1991, she performed in the Jiangsu Provincial Arts Festival and won the first prize on both occasions. Critics have praised the quality of her playing, comparing the surging momentum and tonal effect to that of a virtuoso piano performance. In 1987, Yangqin Zhao attended the Fourth National Congress of Chinese Musicians as the youngest musician in attendance. Her profile appears in the “Who’s Who in Young Chinese”; published in 1990 and “The Chinese Musicians Yearbook” of the same year. In 1992 her name was listed in both “Who’s Who in Musicians of Jiangsu Province” and also “Who’s Who in Jiangsu Educators”. Ms. Zhao has been invited to perform in many countries, including Australia, the Netherlands, Belgium, Singapore, Hong Kong, Mexico and Germany, where she has lectured at universities, conservatories and music schools. In an excerpt from CHIME Newsletter by Frank Kouwenhoven, Secretary-general of the European Foundation for Chinese Music Research, he notes:” I was impressed not only by her high technical standard of playing but also the strong musical feeling she displayed during Performance and by her friendly and modest character.” In June of 1996, she was invited as one of seven musicians who are masters on the Yangqin – like instruments (hammered dulcimer) for the Tanz & FolkFest Rudolstadt (Folk Instruments Festival) in Germany in September, 1996, she performed as the yangqin soloist with Shanghai Ethnic Orchestra. In June 2000, she was invited to perform at the “Concert in the Wildstage” by Berlin Philharmonic Orchestra in Berlin, Germany. More recently, she has performed with Melody of China at the National Folk Festival, the Chicago Jazz Festival, World Lotus Festival, New York’s Lincoln Center, and with Lautten Company in Berlin. Ms. Zhao is currently Executive/Artistic Director of Melody of China, a San Francisco-based Chinese chamber ensemble which she co-founded in 1993. She performs with the ensemble and frequently collaborates with other Bay Area artists and organizations. Collaborations in recent years include Francis Wong, Jon Jang, Marcus Shelby, Deszon Claiborne, Earplay, Lily Cai Dance, Del Sol Quartet, Oakland Ballet, San Francisco Symphony, and others. 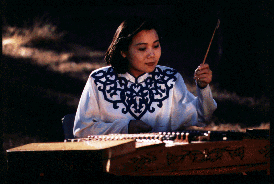 Her recordings of yangqin (hammered dulcimer) music are on both audio and video tapes. Jiangsu Record Company, Wind Record Ltd. Inc. Taiwan, Telemark, Sega and Young Imaginations have included her in CD-Rom’s and CD about worldwide music featuring Chinese traditional music. “Yu Hongmei Erhu Collection” – Vol. I, II (1998). Wind Records Co., Ltd. Taiwan. Yu Hongmei on erhu (Central Conservatory of Music, Beijing), Yangqin Zhao on yangqin (Hammered dulcimer). “Being in Motion” (1994) – Produced by Visible Interactive. “High Moon” (1994) – Solo, duet, Quartet, Quintet and ensemble of Chinese traditional instruments. Produced by Dunhuang Music Ensemble. “Spirit on two Strings” Vol. I, II (1993) – Produced by Wind Records Co., Ltd. Taiwan. Jiebing Chen on erhu (Chinese fiddle), Yangqin Zhao on yangqin (Hammered dulcimer).